The most comprehensive single volume on rhododendrons and azaleas ever published. Listings include extensive assessment of performance of varieties for different countries and climactic conditions. The history of rhododendrons, collecting, naming and breeding. Cultivation of rhododendrons and azaleas. Pests, diseases, problems and disorders. I'm sure my copy will soon become soiled and dog-eared. I would rate this book as an essential reference, a very worthwhile addition to the bookcase. If one's rhododendron library is limited to two books, pick Greer's Guide to Available Rhododendrons and Cox's Rhododendrons & Azaleas A Colour Guide. 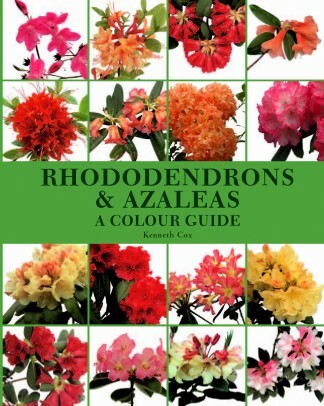 'If you are a rhododendron lover then buy this book. Kenneth Cox's expertise shines through his detailed and authorative book.The book answers all the frequently asked questions about rhododendron cultivation, propagation and maintenance... It is a truly international book! Cox constantly demonstates a knowledge of new hybrids across world markets and records the idiosyncracies of their breeders; he details international hardiness ratings, he recognises that the seasons vary from hemisphere to hemisphere and gives proven performances codes for where ever you live in the world. As an Australian, who is used to having to find appropriate information hidden in a foot note, this is very welcome. Although his writing is technical, it is peppered with asides which give you the impression he is speaking to you frankly, lightening the tedium of Latinised botanical terms. Cox also gives you his ten best hybrids and his ten worst together with the ten best of everything else on a great list page. Pictures from his own garden and nursery at Glendoick in Scotland predominate and as a result you need to supplement his text with the excellent photo indexes available of the Americian Rhododendron Society to see illustrations of flowers not common in his climate. Most reference books I use I get a few hours worth of help. After over 30 hours worth of use I am still going strong with this book and it will be many years before my expertise is sufficient to put it away on a shelf'. Over 1200 pictures: 200 illustrating cultivation practice, propagation and gardening design ideas, and well as over 1000 plant portraits.